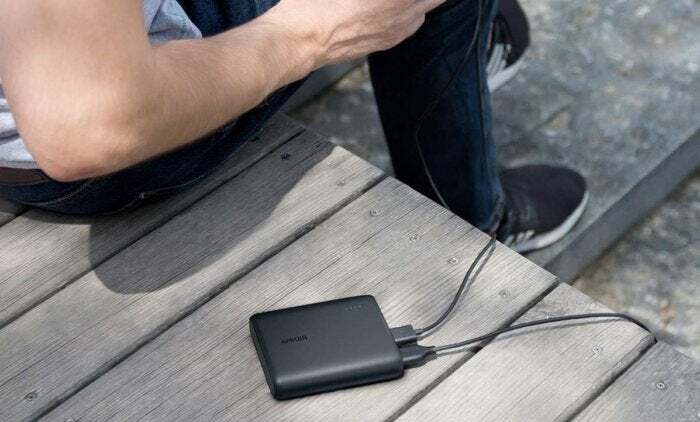 Anker's PowerCore 13000 power bank can help keep your device charged up wherever you go, and today you can grab one near its lowest price ever. A phone’s “low battery” message can strike dread (or at least annoyance) into even the most unmoved of hearts. But it doesn’t have to spark a desperate search for an outlet. A power bank can help keep your device charged up wherever you go, and today you can grab one near its lowest price ever. The popular Anker PowerCore 13000 is $30 today on Amazon, down from a list price of $37. This 13000mAh power bank brings a massive amount of juice in a tiny package, with its sleek wallet-sized form carrying enough power to charge an iPhone X or a Galaxy S9 three times. Two ports allow you to plug in multiple devices at once, while PowerIQ high-speed charging capabilities mean your device will be powered up in no time. We haven’t tried this exact power bank ourselves, but we generally love Anker and its other accessories. Even before that vote of confidence, though, the PowerCore 13000 is a hit on Amazon, with 4.6 stars out of 5 across more than 6,000 user reviews.